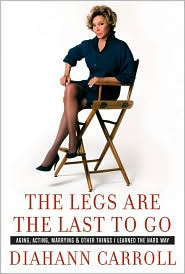 Robin Roberts: [Richard Rodgers] wrote it for you. He wrote it for you. And people don't realize that you were not even allowed to go to the opening, the opening party for your own show. Diahann Carroll: The opening party in Detroit. That's right. It was a remarkable thing that Richard Rodgers should call me. I was not that well known. But whatever happened when he saw the television performances that I was doing, he decided to do a show for me. It's one of those magical, unbelievable things that happens in one's life, affects one's carreer and one's total life. It was a blessing and it catapulted me to other things. She was a magnificent Norma in Sunset Blvd. I sat front row. With my mom. Toronto. 1996. It was amazing. Did I ever tell you about the time at least a dozen years ago that I sat right next to her on a flight from Philadelphia to LA? Not one word was spoken, sorry to say. But Steve! I'm shocked and chagrined.